ONLY God knows the trauma the owner of a university certificate found with a suya (roasted beef) vendor in Lagos might have gone through. 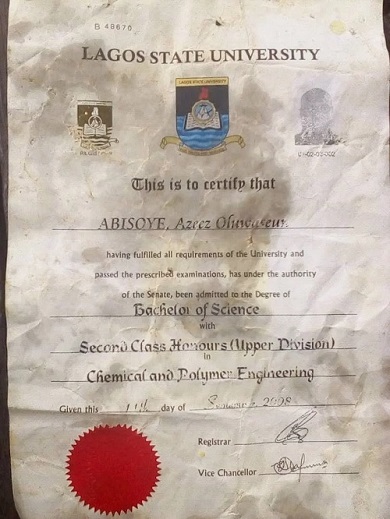 The certificate issued by Lagos State University, LASU to one Abisoye Azeez Oluwaseun, a 2008 graduate of Chemical and Polymer Engineering, suspected to have been lost was found recently with a Suya vendor at Iraye-Oke Community, Epe Local Government, Lagos State. Reports suggest that a good Samaritan, Kufo Akorede Olawale, a native of the community found the Certificate when the Suya Man was about to use it to wrap meat for his customer. Touched by what the owner might have gone through since the loss of the Certificate, Kufo retrieved it from the Mallam (Suya Vendor), snapped and shared it on various Whatsapp groups and other social media platforms to possibly inform the owner or anyone who knows him about the discovery. Kufo Akorede Olawale can be reached on 09072949972 or 09073342700.